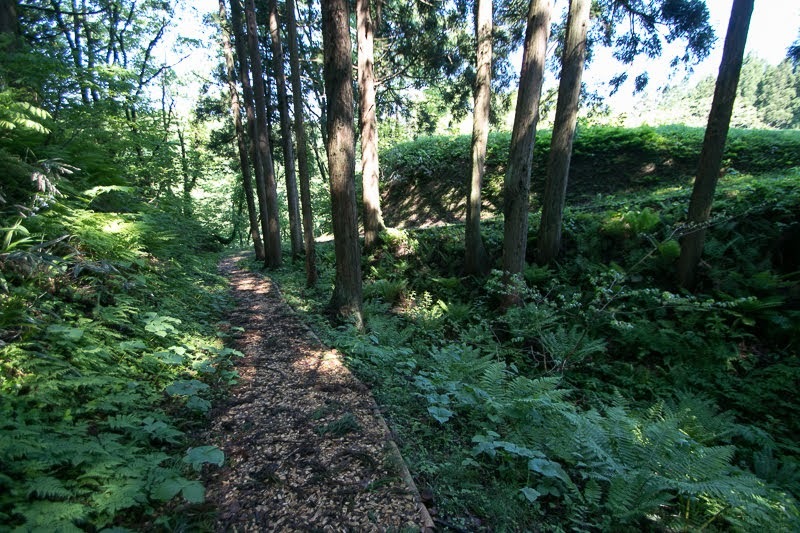 Shimizu castle (清水城) is built utilizing peninsular like height at the west side of Mogami-gawa river in Shimizu town of Okura village. 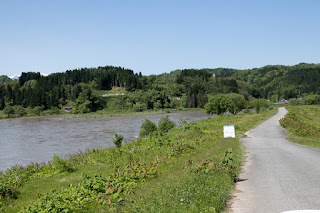 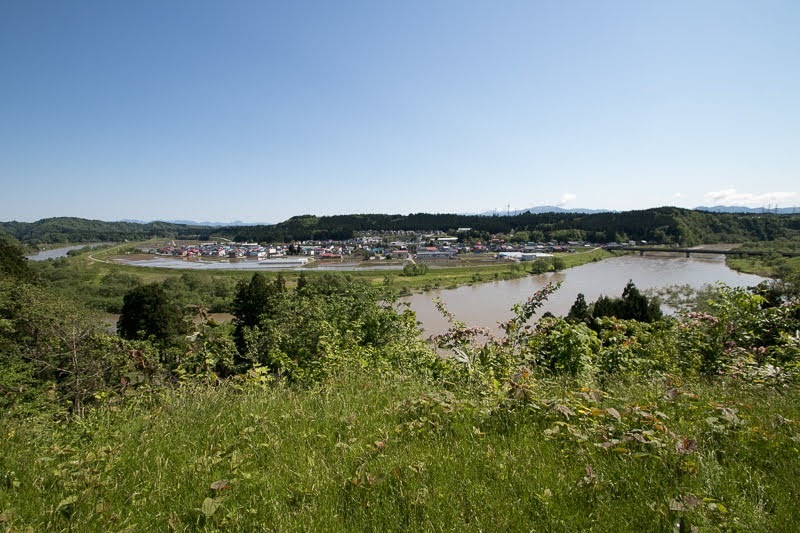 Okura village is the one at the south edge of Shinjo basin which seizes the corner of reverse “L” letter shaped Yamagata prefecture, and at the middle stream of Mogami-gawa river. Shimizu town had prospered as one of major river ports of Mogami-gawa river along with Oishida-port or Aterazawa-port. 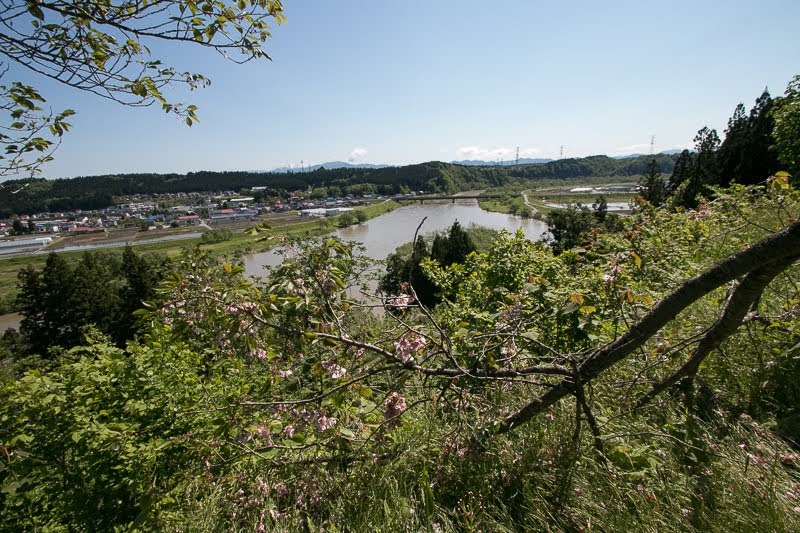 Not only its geographical condition as an access point to Shinjo basin or Gassan Mountain which was worshiped as a sacred place of Shugendo, but also Mogami-gawa river has plenty of water downstream from Shimizu area thus large or passenger ships must stop at Shimizu area. It is said that Shimizu castle was built by 1476 by local lord Shimizu clan. Shimizu clan was a relative of Mogami clan, which was a descendant of Shiba clan which was a high class retainer of Muromachi Shogunate and was appointed as a general governor of Dewa province (Yamagata prefecture). Mogami clan placed their relatives throughout the province and Shimizu clan was one of such relatives. 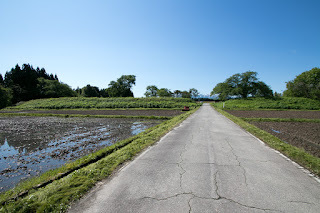 At first Shimizu clan was named as Narusawa clan and stayed at Yamagata basin, but in the latter half of 15th century they moved northward with Mogami-gawa river then seized Shimizu area. 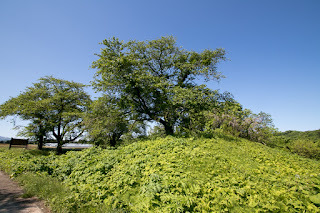 Shimizu clan built Shimizu castle at riverside to seize river port, and became one of major local lords of Shinjo basin along with Sakenobe clan of Sakenobe castle or Oguni clan of Oguni castle. 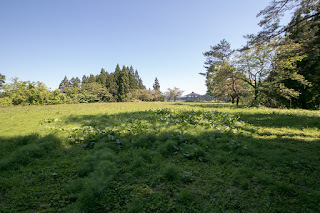 In the former half of 16th century, Mogami clan which was the supporter of Shimizu clan significantly lost their power because of the conflict against Date clan and internal conflicts and once was close to disappear. 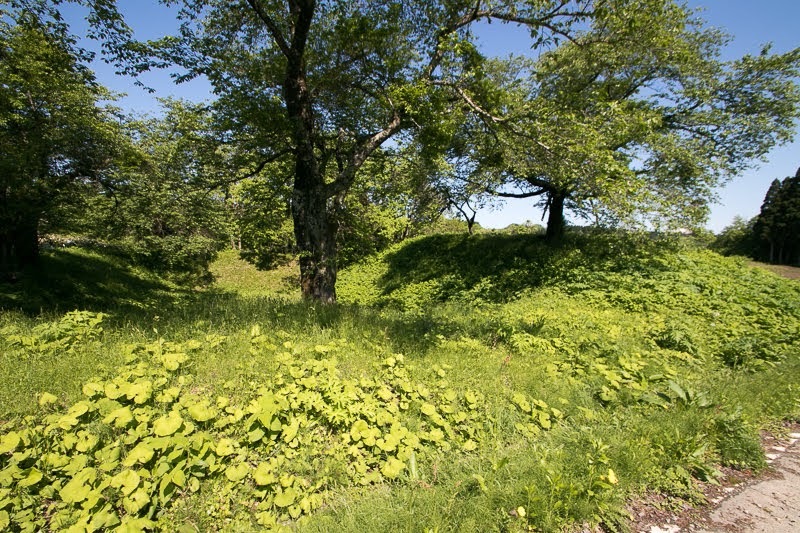 On the other hand, at Shonai plain on the mouth of Mogami-gawa river, local lord Daihoji clan of Oura castle (Yamagata prefecture) also suffered from conflicts against surrounding lords but tried to expand toward upstream of the river. 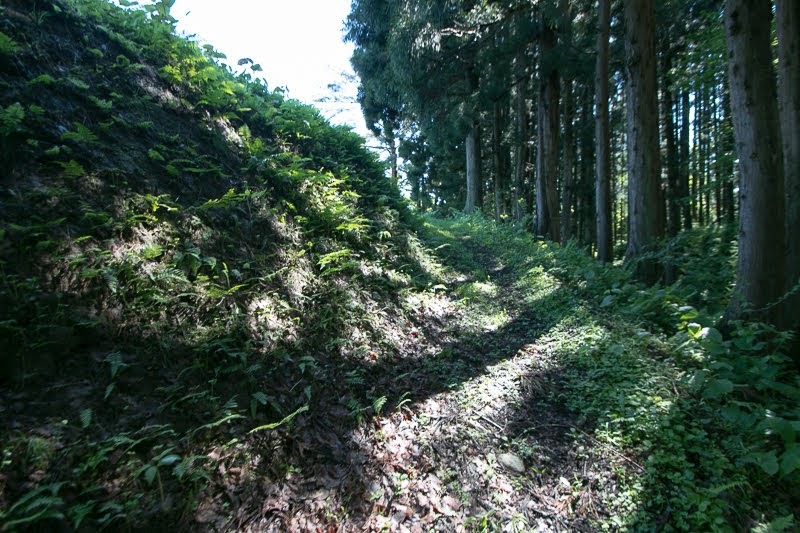 Being supported by the economic profit from Sakata port and rich rice production, and alliance with Uesugi clan which was the strong warlord of Echigo province (Niigata prefecture), Daihoji army was stronger than Shimizu clan. 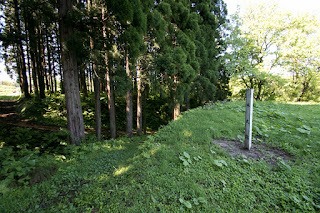 To cope with fierce attack of Daihoji army, Shimizu clan might expand and strengthened Shimizu castle for their survival. Shimizu castle spreads over narrow height of about 400 meter long and 100 meter wide spreads north and southward, The height itself is separated by the valley of creek from backside mountains and appropriate place to build a castle and castle town. 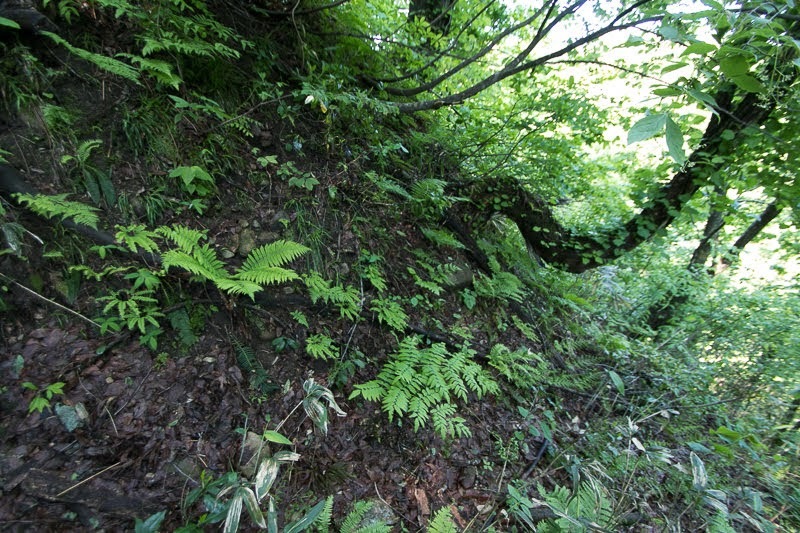 Eastern line of the castle directly faces the flow of Mogami-gawa, river, and western line is separated by a valley from backside plateau. Central area of the castle is a clearly rectangular one of about 60 meter long and 40 meter wide, in the north half of the plateau which might have the residence of the lord. 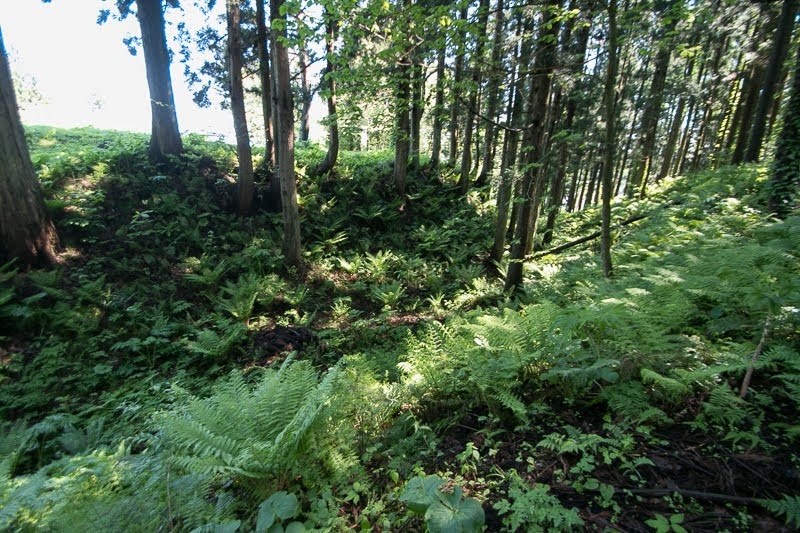 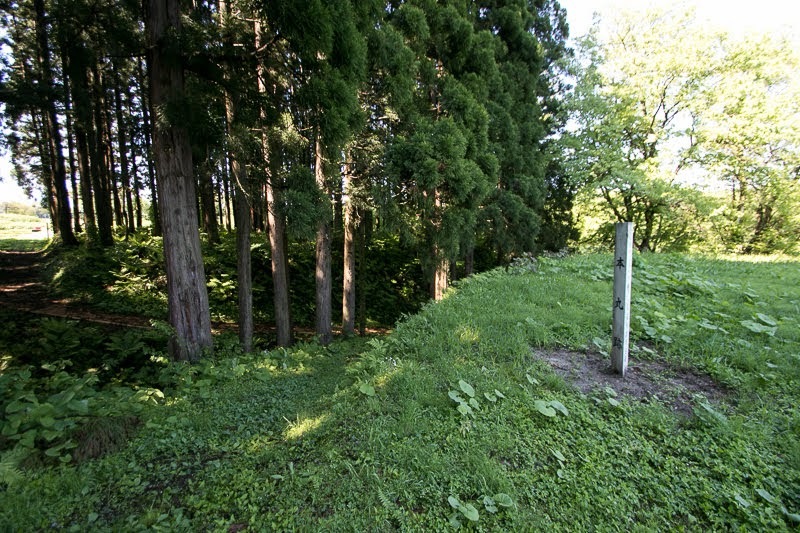 At the north and east of central area there are several small terraces which might keep the original shape of the castle. 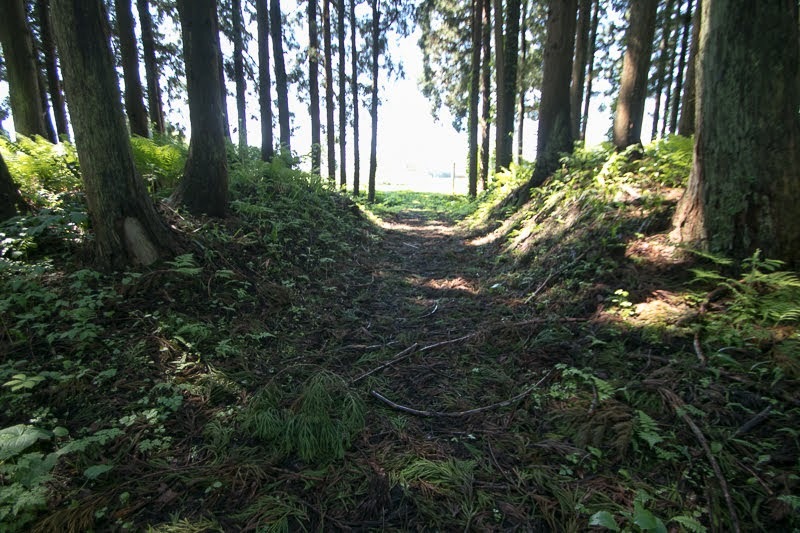 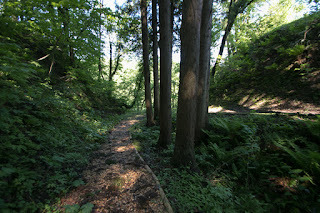 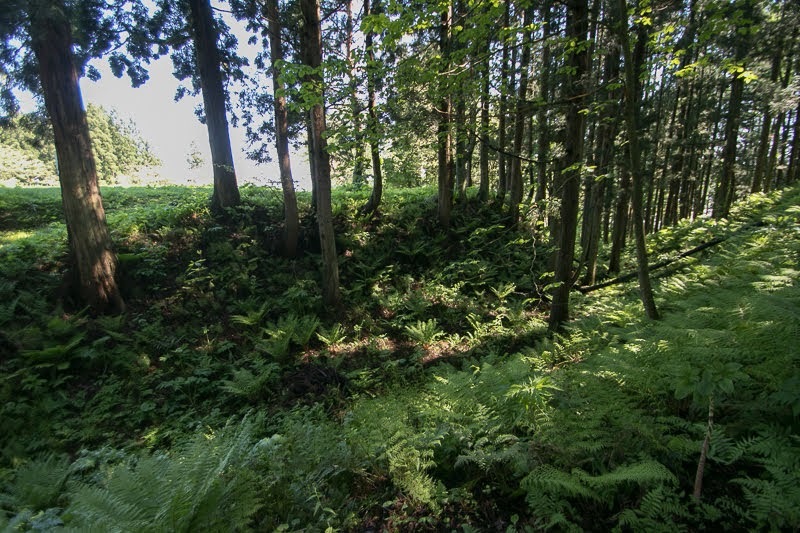 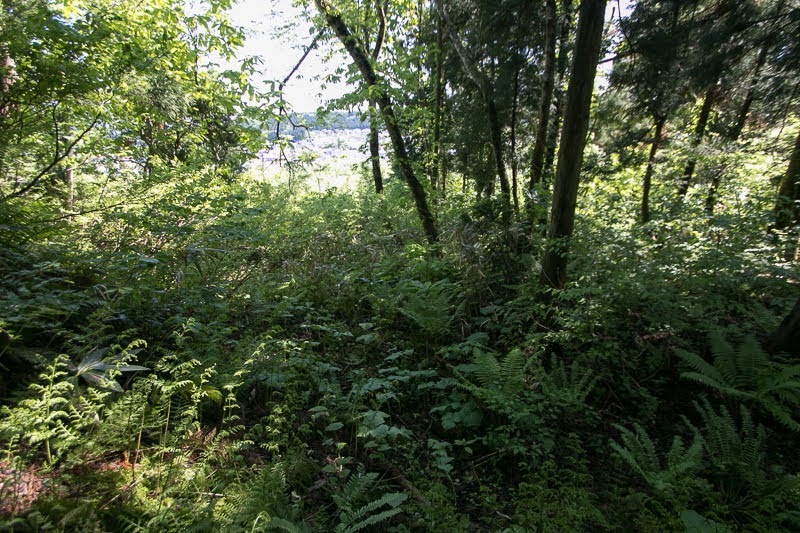 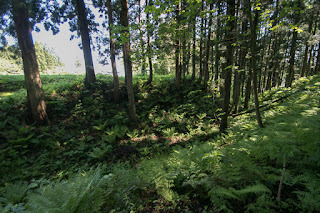 This north half is separated by large dry moat of over 15 meter width spreads toward riverbed. 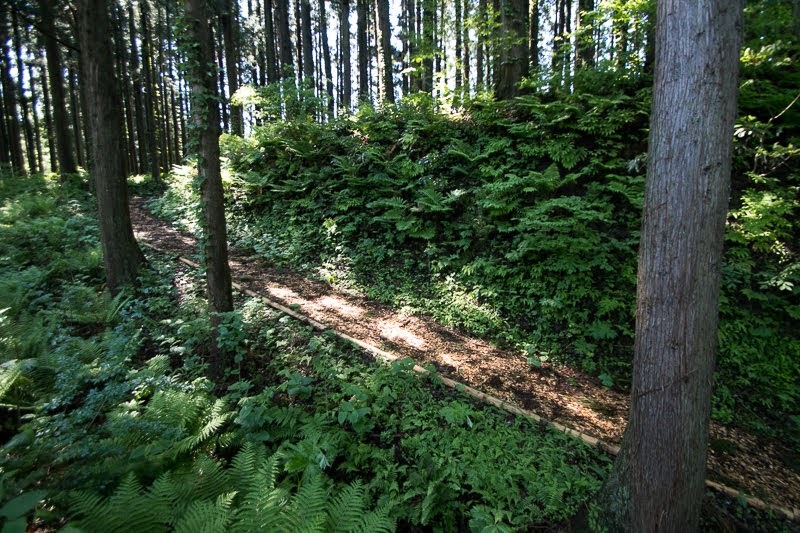 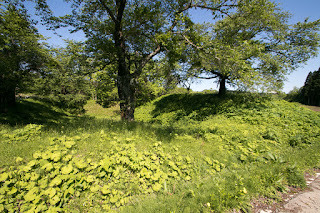 South half of the castle consists of buffer area at the north and secondary area at the south. Buffer area is a small area surrounded by small dry moat and clay wall, which is built to protect the entrance of central area. 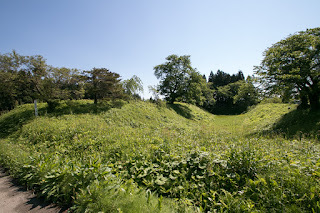 Third area is a large square one of about 100 meter long, and its south line is protected by combination of tall clay wall and water moat. Total size of the castle is about 300 meter long and 100 meter wide, and its size and well constructed structure shows the importance of the castle. 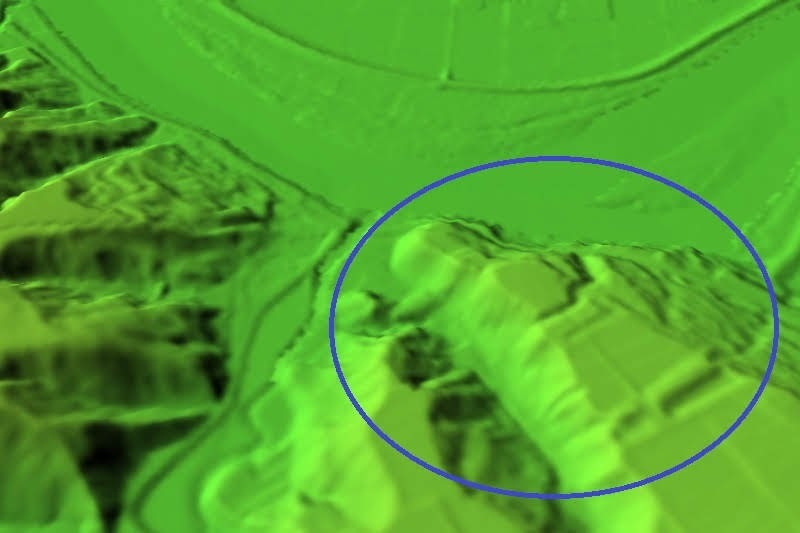 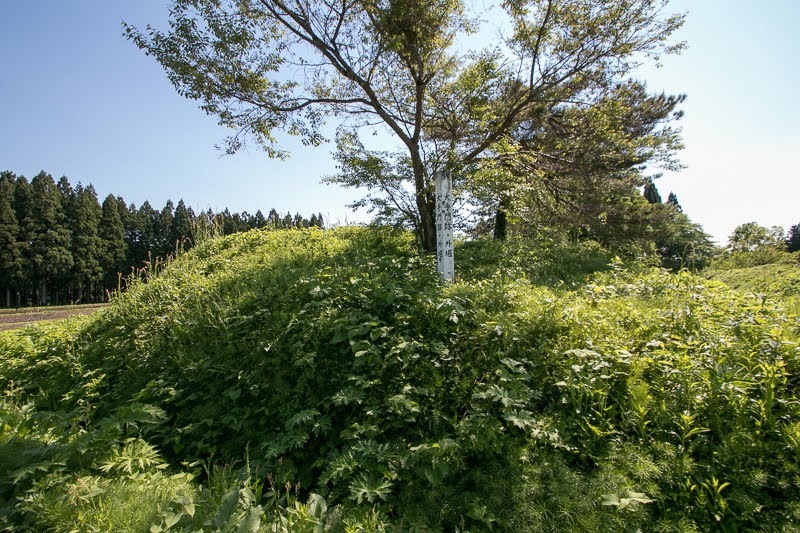 Castle town might spread small height at the east of the castle, and river port might be built at the below of eastern slope. 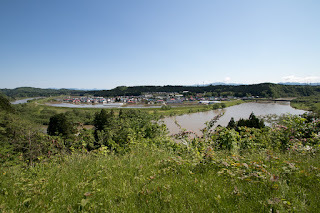 Shimizu town located at the opposite side of the river, which is a crescent shaped flat area surrounded by curving Mogami-gawa river. 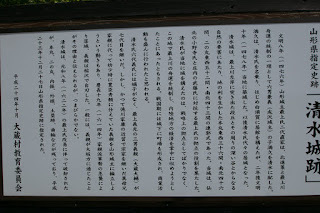 Before the fierce attack of Daihoji army, Shimizu clan suffered severe defeat in the battle of Motoaikai and lost its leader. 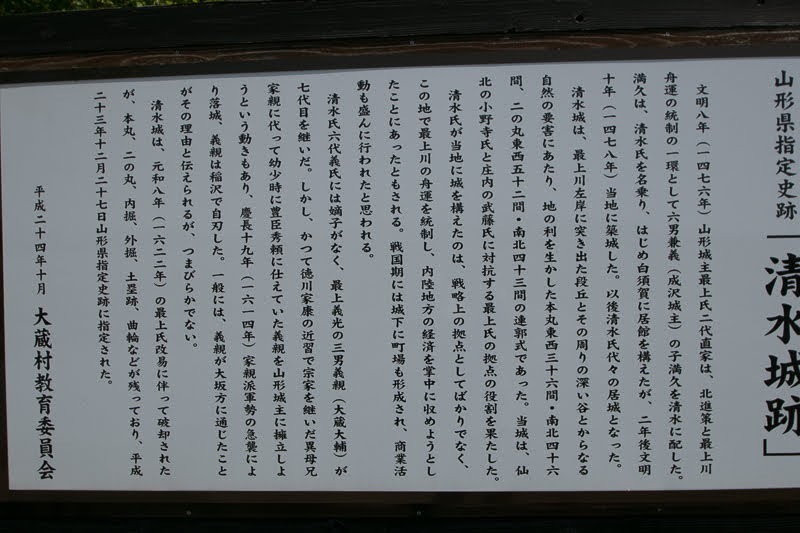 Next leader asked assistance to Yoshiaki Mogami (1546-1614), the leader of Mogami clan which recovered its power and aimed at unite of Dewa province, then adopted Yoshichika Shimizu (1582-1614), the third son of Yoshiaki. 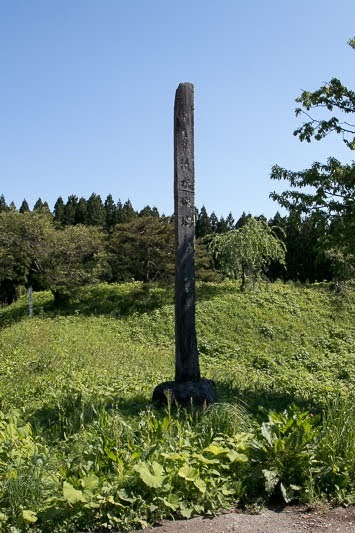 In 1570’s Yoshiaki Mogami gradually grew his territory toward north, and Daihoji clan decreased its power from the suspension of support from Uesugi clan and too aggressive military operations. 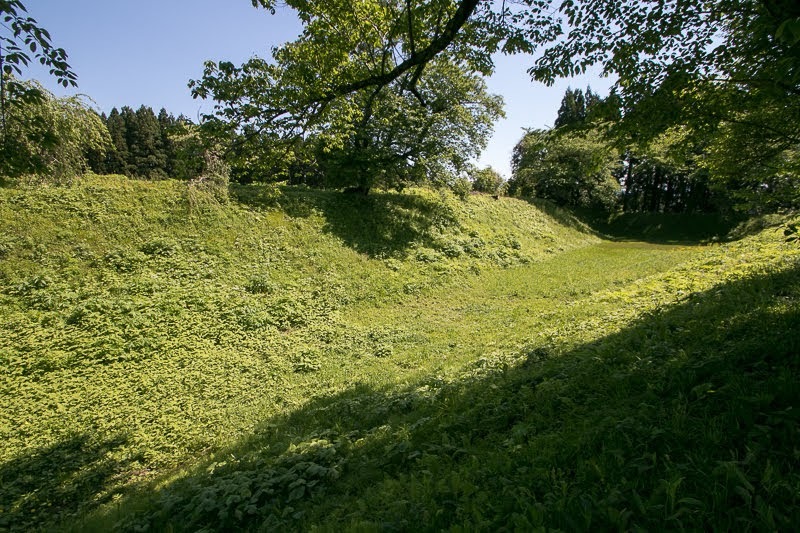 In 1585 Daihoji clan raised their army to attack Shimizu castle but their retainers made rebellions, then utilizing this opportunity Yoshiaki Mogami intruded into Sakata basin and ruined Daihoji clan. However, in 1588, Uesugi clan intruded into Shonai plain, and Mogami army was defeated in the battle of Jugorigahara then lost Shonai plain. 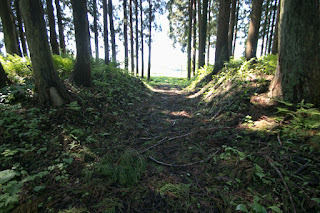 Uesugi army then advanced into Mogami territory but Mogami army drove back, then Shimizu castle became the border castle of Mogami clan toward Shonai plain again. 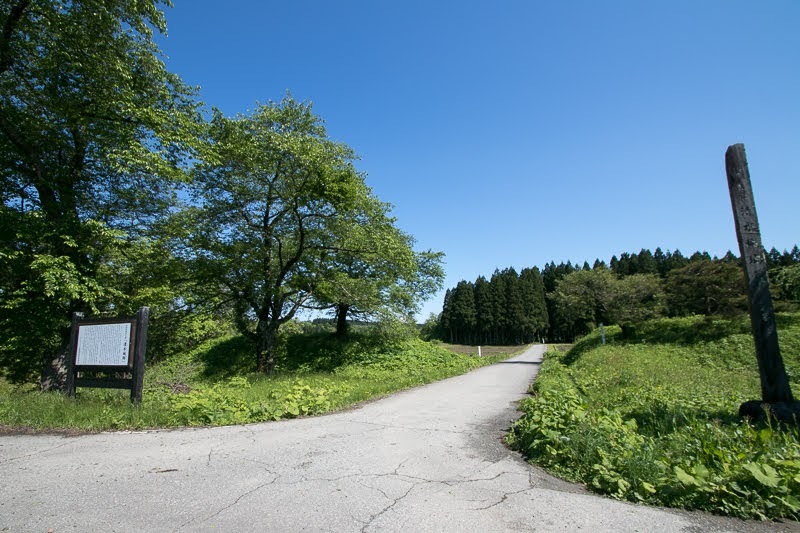 In 1600, as a result of the battle of Sekigahara, On the battle of this time against Uesugi clan, Yoshichika Shimizu became a commander of counter attack and activated. 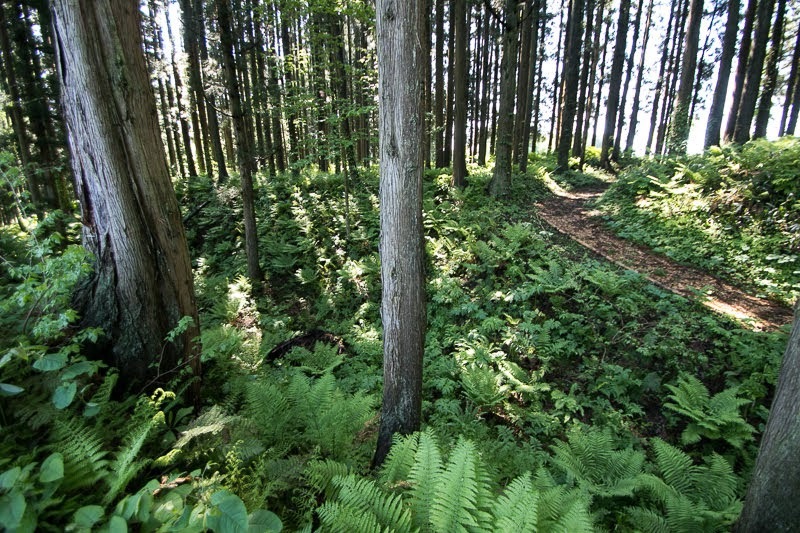 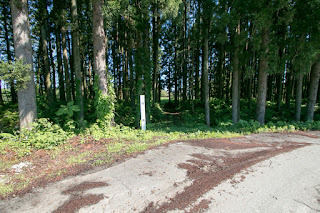 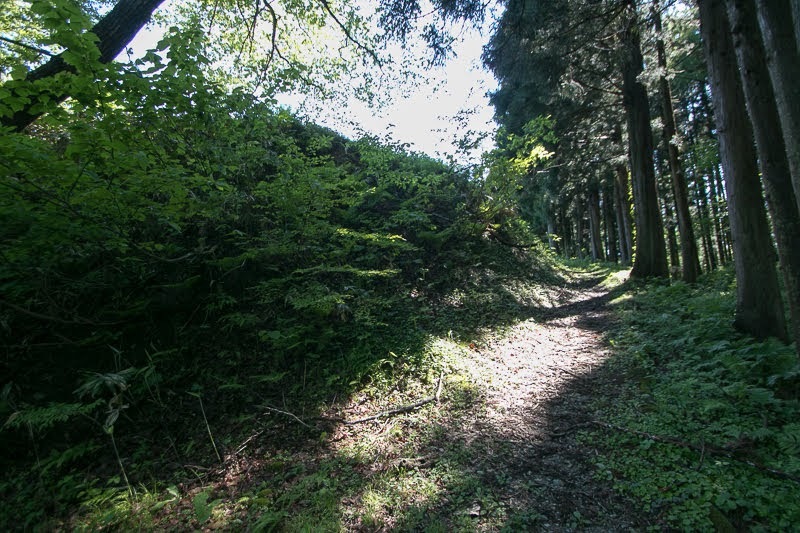 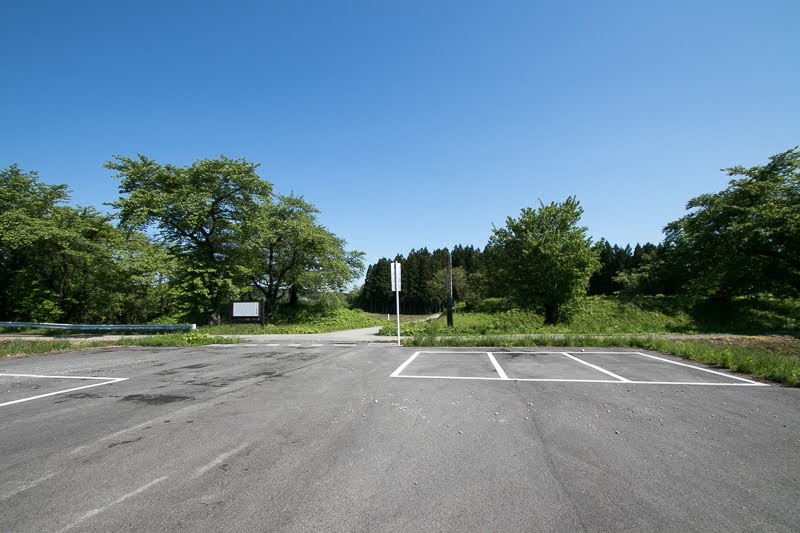 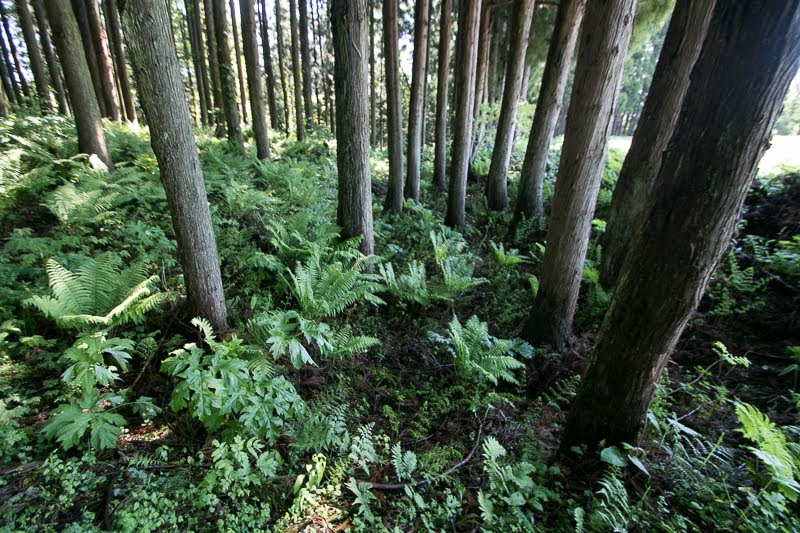 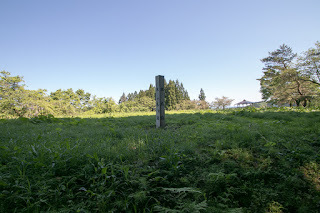 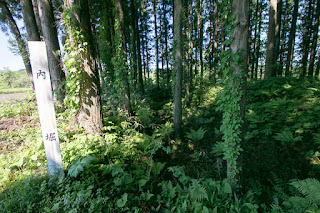 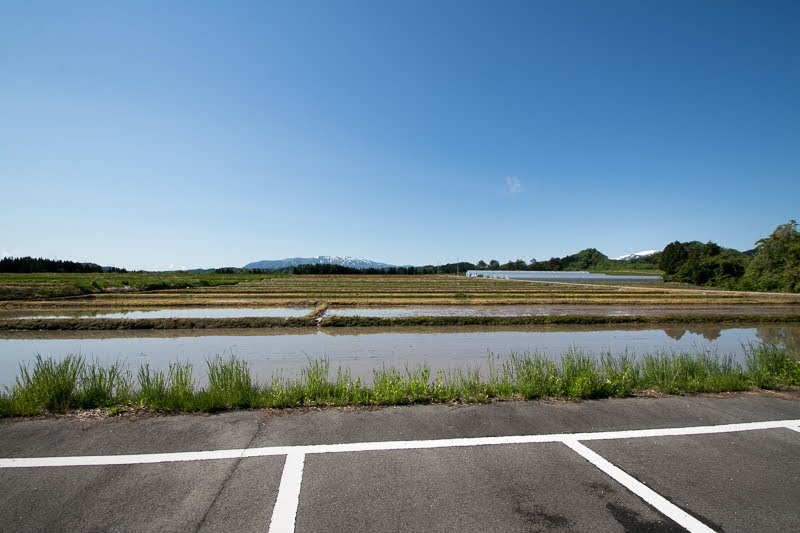 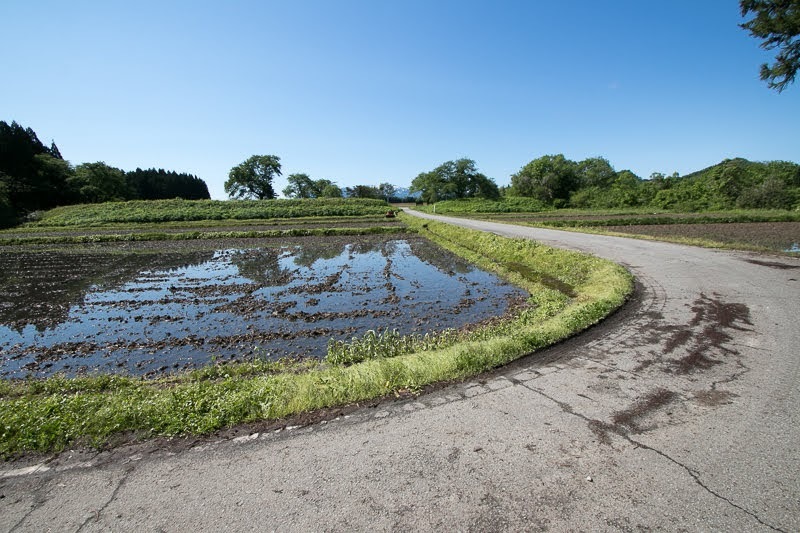 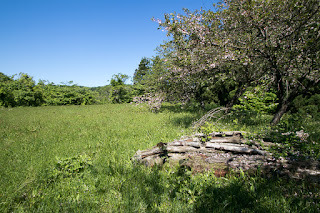 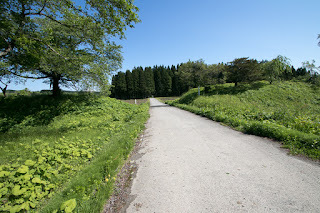 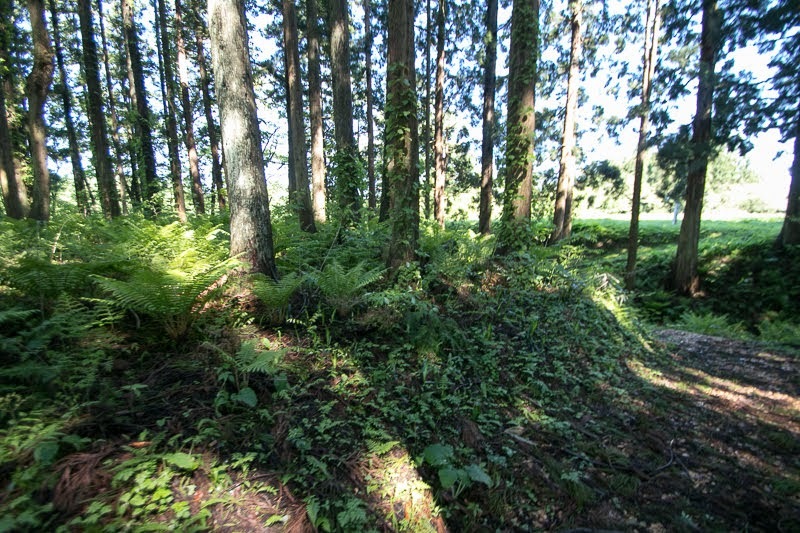 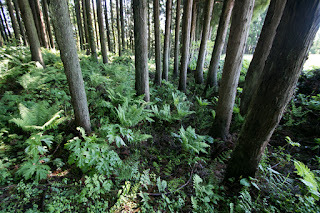 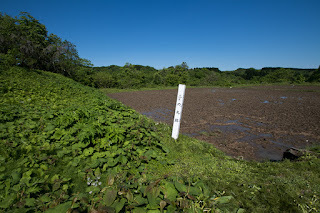 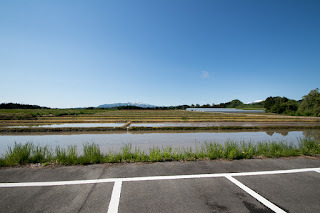 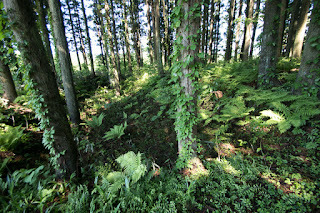 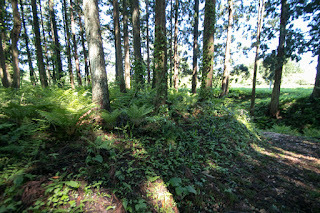 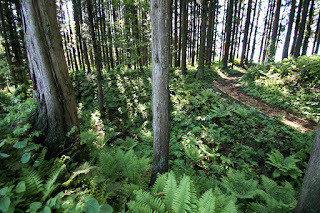 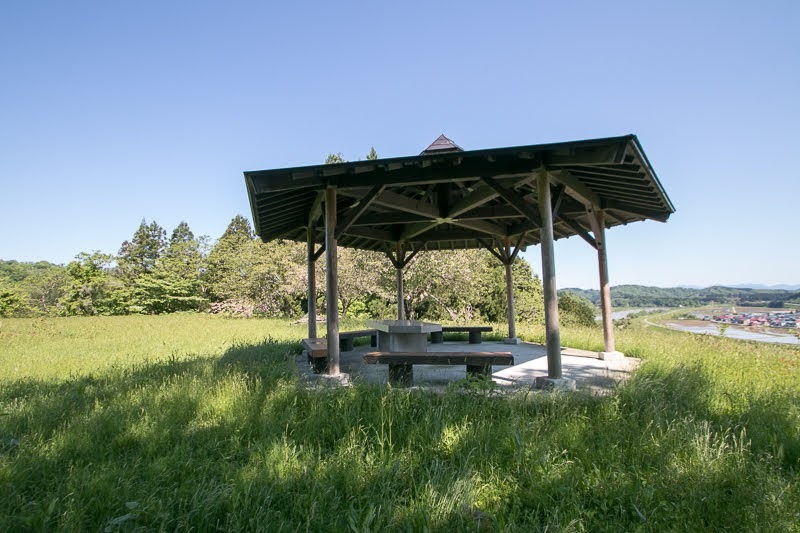 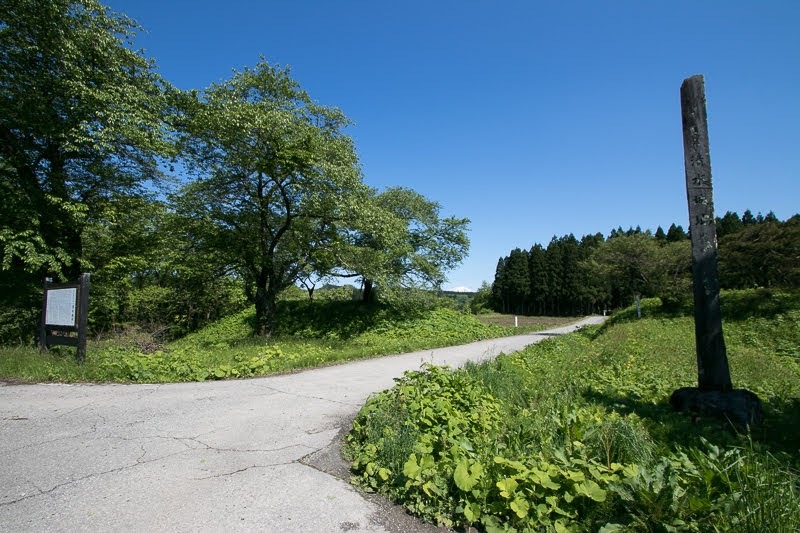 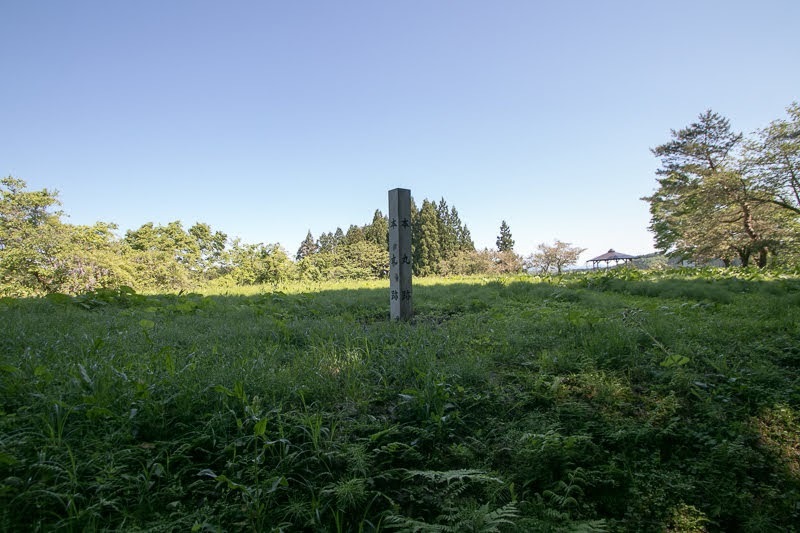 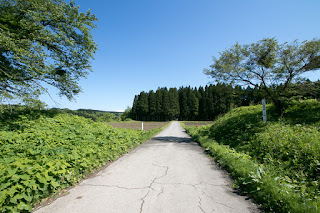 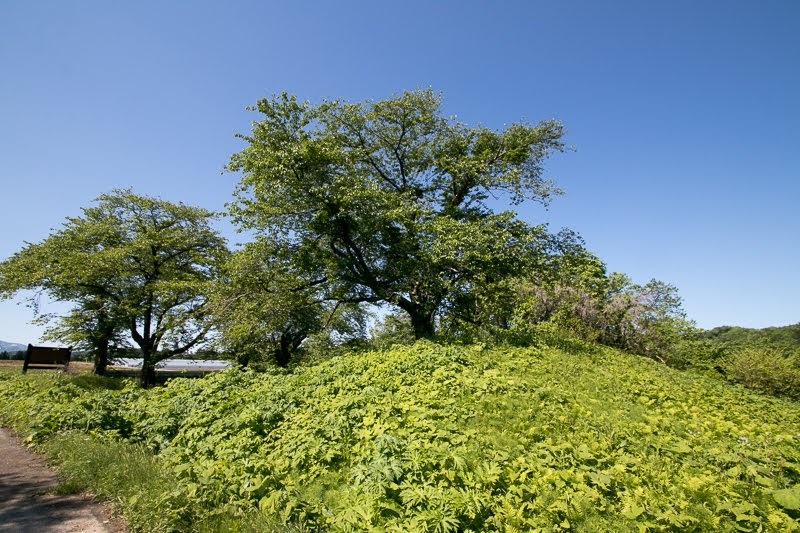 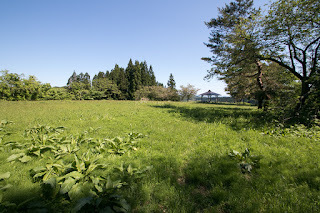 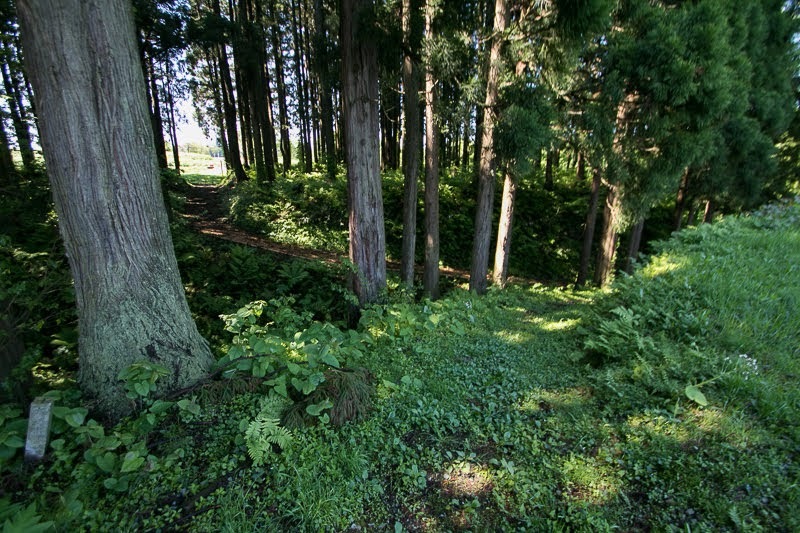 Shonai plain returned to Mogami clan. 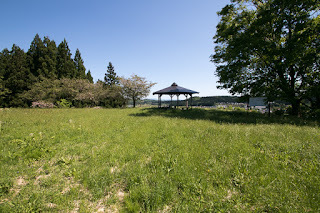 Mogami clan which seized most part of Mogami-gawa river including Sakata port developed river transportation of the river, and Shimizu port became an important connecting port of the river. 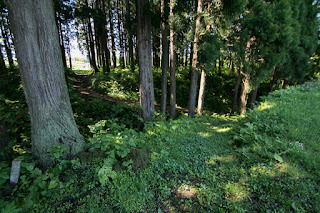 However in 1614, after the death of Yoshiaki Mogami, next leader Iechika Mogami (1582-1617) who was an elder brother of Yoshichika Shimizu suddenly assaulted Shimizu castle and killed Iechika. 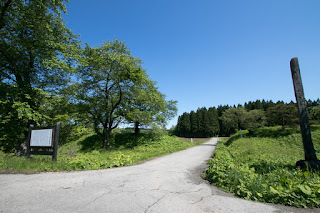 It is said that Yoshichika Shimizu once became a hostage of central ruler Hideyoshi Toyotomi (1537-1598) and served his son Hideyori Toyotomi (1593-1615), and looking at the arrival of the battle between Hideyori Toyotomi and Edo Shogunate, Mogami clan intended to show the loyalty to Shogunate. 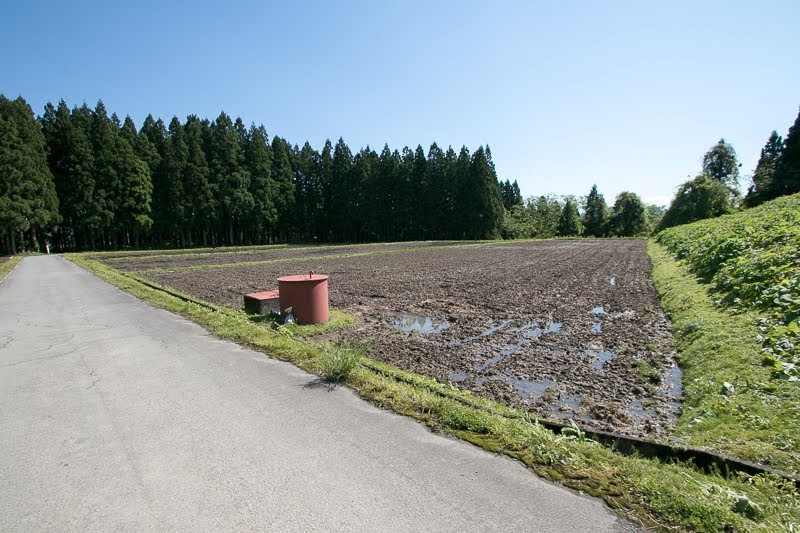 Besides, there was an internal conflict of Mogami clan for succession of Yoshiaki, occurred from conflict between important retainers. Moreover, Iechika might hope to handle whole part of river transportation of Mogami-gawa river and tried to preclude the economic right of Shimizu clan. 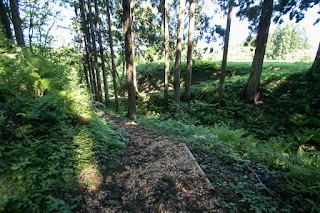 Mogami clan captured Shimizu area abolished Shimizu castle, but Mogami clan itself was expelled in 1622 because of internal conflicts, just after eight years from this. 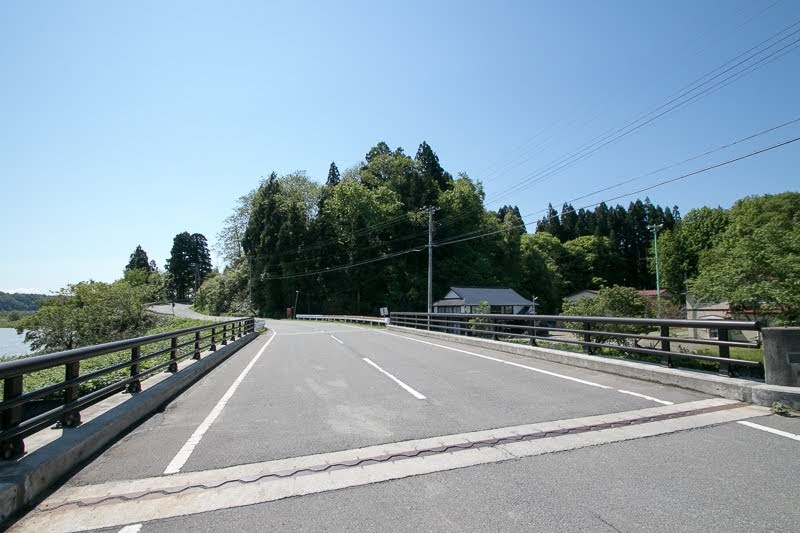 After the fall of Shimizu clan and Mogami clan, Shimizu port still prospered as a river port and posting town of Funagata-Kaido road by the end of Edo era, along with Motoaikai town just at 2 kilometer downstream from Shimizu town. In 1689, a wondering poet Basho Matsuo (1644-1694) embarked river ship of Mogami-gawa river from Motoaikai port during his trip. 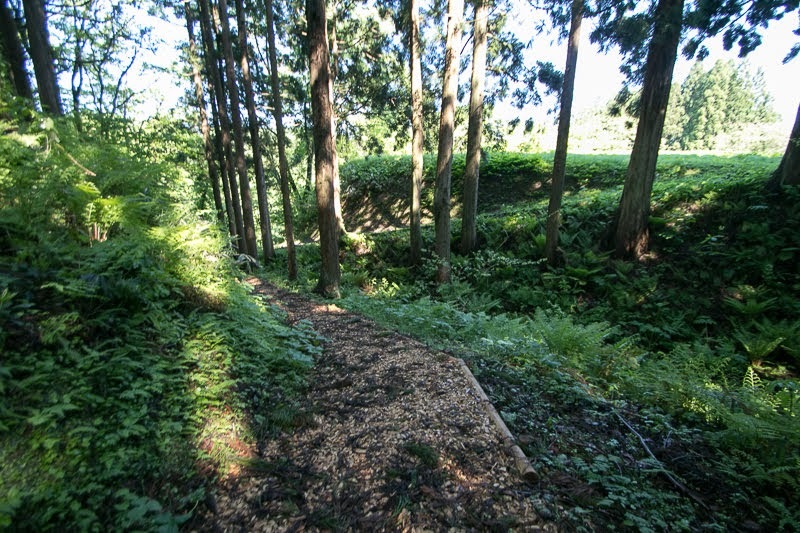 Along with the cease of river transportation Shimizu area returned to quiet place, but structures of Shimizu castle well remain on the height. Well constructed Shimizu castle clearly shows past importance and prosperity of Shimizu area and river transportation of Mogami-gawa river, along with remaining Honjin posting building at the opposite of the river. 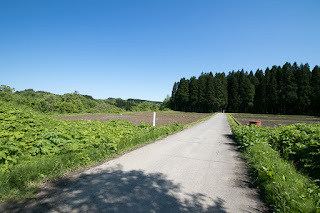 20 minutes drive from Tohoku-Chuo Jidoshado Expressway Shinjo interchange.